The release of the information proved to be an effective barometer to show how the Afghan National Security Forces (ANSF) were faring. It would demonstrate if more money, or less, was needed to help the military force in its battle with the Taliban. The data would show how many troops needed to be trained, which helped to show how many Afghan soldiers were dying on the battlefield, had deserted or simply quit. With the decision by the Pentagon to make this data top secret, the US will now have the ability to spend as much money as it pleases, with the public none the wiser. The US commander in Afghanistan, General John Campbell, said it was the correct move to make the information top secret, saying it could have given the Taliban valuable intelligence concerning US and Afghan plans. "With lives literally on the line, I am sure you can join me in recognizing that we must be careful to avoid providing sensitive information to those that threaten our forces and Afghan forces, particularly information that can be used by such opposing forces to sharpen their attacks," Campbell wrote to the special inspector general for Afghanistan reconstruction in a letter dated January 18, AP reported. Steve Aftergood, a secrecy expert at the Federation of American Scientists, believes that the reason to make the information secret has nothing to do with making sure the Taliban does not have the chance to gain a valuable insight into US policy. “The reality is that much is classified just to take the issue off the public agenda. That is not what classification is for, but it often serves a purpose,” he stated in an article written in the New York Times. 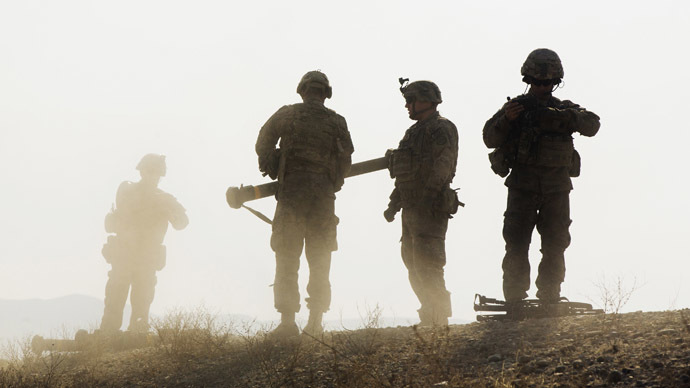 The responsibility for tracking where the $65 billion of taxpayers’ money is being spent fell to the special inspector general for Afghanistan reconstruction (SIGAR), which published its findings in a quarterly report. Public access to its web page has now been blocked. John Sopko from SIGAR was disappointed at the US government’s decision and said it was “unprecedented” to classify such a large amount of information. "The decision leaves SIGAR unable to publicly report on most of the $65 billion US-taxpayer-funded efforts to build, train, equip and sustain the ANSF," Sopko's office said in its latest report, which was reported by AFP. The SIGAR report also stated that the military gave classified or restricted answers to more than 140 questions that the inspector general put forward. These included information concerning the total amount of funding for Afghan forces in 2015 as well as anti-corruption initiatives and aid projects. The watchdog also noted that the US is spending more than $300 million on Afghan police salaries, despite the risk that these funds are being wasted and abused. Following an audit of the Afghan National Police (ANP), SIGAR found that pay was often inflated and salaries were given to more employees than were authorized, Reuters reports. "Unless the MOI [Afghanistan Interior Ministry] develops the capability to ensure and verify the accuracy of ANP personnel and payroll data, there is a significant risk that a large portion of ... US government funding for ANP salaries will be wasted or abused," SIGAR said. Sopko’s viewpoint concerning a lack of transparency was shared by politicians in Washington, who believe it is important to hold the government accountable for its actions in helping to reconstruct the country. "I'm offended that this previously-unclassified information is now being classified, in a move deeply detrimental to our efforts to root out waste and fraud," said Senator Claire McCaskill, a member of the Senate Armed Services Committee. SIGAR says following 17 investigations, which including a number of financial audits, it found that $23.6 million was questionably spent. The organization also said that $15.3 billion from the $107.5 billion, which was allocated by Congress to be used for the reconstruction of Afghanistan has yet to be spent.